The initial Infill Development Concept Plan (IDCP) submission by Boston Properties (the Applicant) was submitted on 8/9/2016. At a joint hearing of the Planning Board and CRA Board on 9/20/2016, both Boards had the opportunity to review the IDCP documentation and provide feedback. For the hearing, staff memos analyzing the initial submission documents were prepared by the Department of Public Works (DPW), Traffic Parking and Transportation (TPT), Community Development Departments (CDD) and CRA Staff with memos from the CRA’s design review consultants. 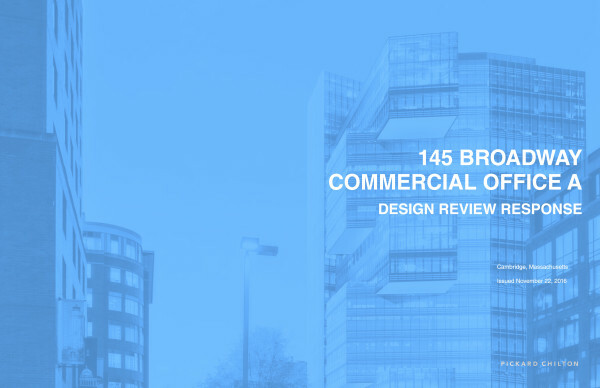 A public CRA Design Review committee meeting was held on 10/19/2016 specifically focusing on the separate 145 Broadway Building Design Review submission provided by the Applicant with the original IDCP on 8/9/2016. This public CRA Design Review committee meeting included the active participation of several representatives of CDD and CDD’s consultants. 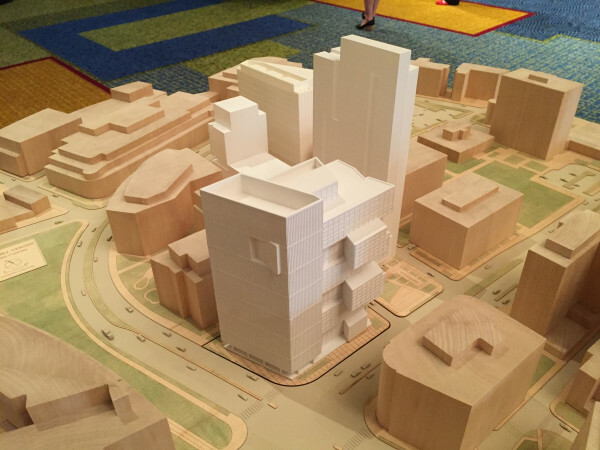 While this meeting focused on a single building, it covered refinements of the building’s form and relationship to the overall urban design of the IDCP, previewing massing alternatives addressed in the IDCP response and revisions documents submitted 11/10/2016. After the initial August hearing, CRA staff delineated all of the comments from the public and Car and Planning Board members along with the technical memos. This master list of comments was then provided to the Applicant in order to ensure that all parties were working off a common set of issues and facilitate the Applicant’s creation of a comprehensive response and revisions document, which was then submitted to CRA and CDD on 11/10/2016. An outline of the updated IDCP submission was presented to the CRA Board on 11/16/2016. The Planning Board held a new hearing on 12/21/2016 to reintroduce the IDCP to a new quorum of the Planning Board. City staff prepared new technical memos in response to the additional materials from the Applicant. Members were provided an overview of the original submission and updates provided in the November 2016 response and revisions documents. This concludes the project's public participation component through the CoUrbanize website. This coUrbanize site will now be archived. We have done our best to incorporate your ideas and comments into first the zoning process in 2015 then the planning and design process in 2016. We hope you have found the experience engaging and useful. We may consider continuing to use this forum to post major construction milestones as construction progresses in the future, as well as designs for phase 2 and 3 in future years. You may also find updates and document links on the CRA Kendall Square website. Boston Properties, the designated redeveloper for the KSURP has completed its Infill Development Concept Plan proposal for new commercial and residential buildings in Kendall Square, including a Schematic Design for the first proposed building, 145 Broadway. The CRA Board and the Planning Board will conduct a joint public hearing to review the proposal on September 20th. The full document is available on our website. Thanks to those who attended our open house last night. 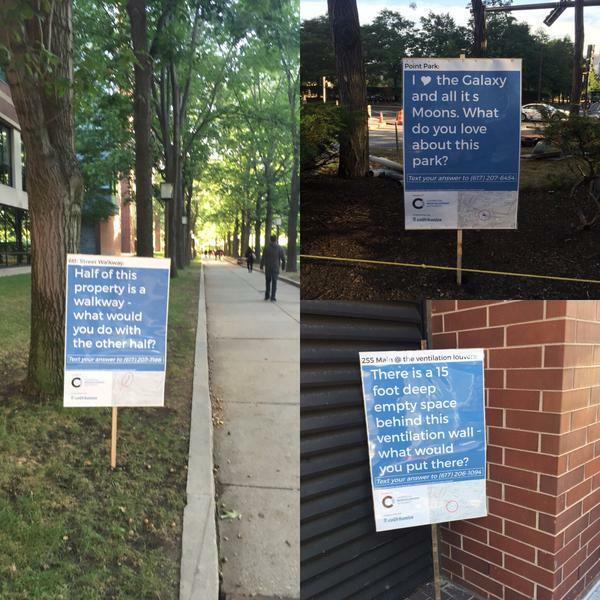 We enjoyed hearing your thoughts on the concept designs for new buildings and public space. Tonight, the Cambridge Redevelopment Authority Board is meeting at the Cambridge Police Station (125 6th St) at 5:30pm. 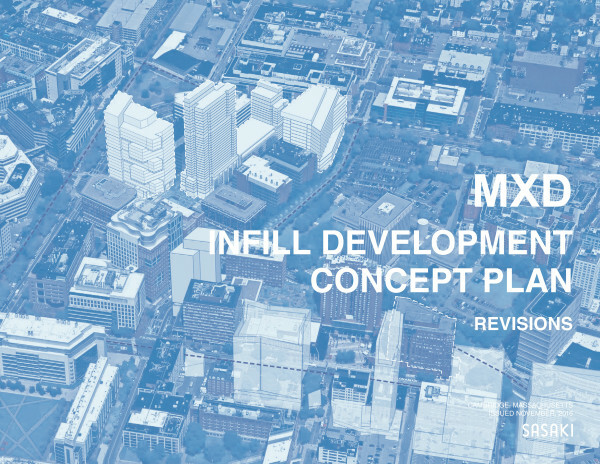 You're welcome to join for a recap of the infill concepts. Stay tuned for news of another open house this fall. In the meantime, we invite your to add your ideas for a more livable Kendall Square to the map here. Be sure to check out all four topics: neighborhood, retail, transportation, and open space. Have a great summer! All community members who live or work in and around Kendall Square are invited to attend the Open House. Find out what is planned for the neighborhood and give us your thoughts. Eight stations, each with an expert! Discuss Open Space, Sustainability, Implementation, and more. Tell us what you think on the new Interactive MAP or write out your comments at the CoUrbanize table. Can't make the Open House? Come to the CRA Board Meeting, the following night on Wednesday, July 20th, at 5:30pm, at the Cambridge Police Station, located at 125 Sixth Street. 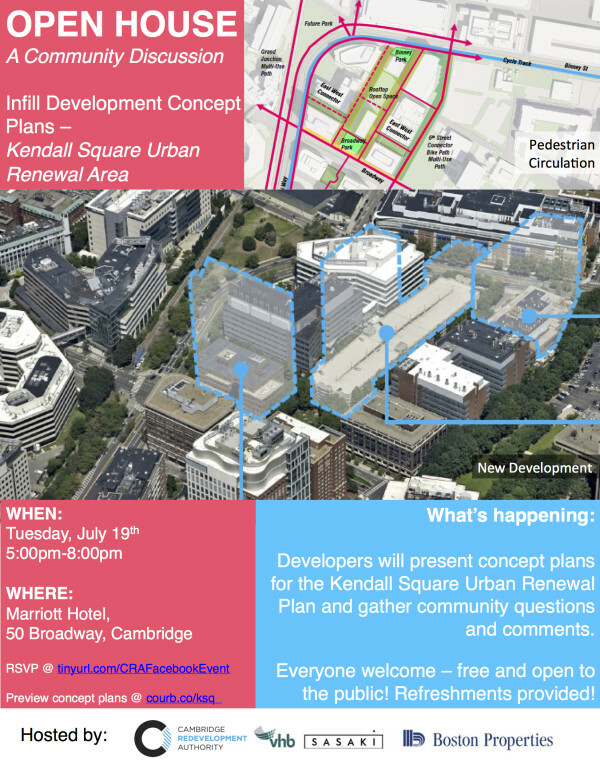 A series of meetings are scheduled over the next month related to the next phase of development and public improvements within the Kendall Square Urban Renewal Plan area. Boston Properties is preparing a detailed Traffic Impact Study to be included as part of the Infill Development Concept Plan. The City will be working with Stoss Landscape Urbanism for the design of these new open spaces. The initial design concepts are guided by the Eastern Cambridge/Kendall Square Open Space Study and Connect Kendall Square Open Space Competition. Boston Properties will present to the Cambridge Planning Board an outline of their proposed Infill Development Concept Plan. 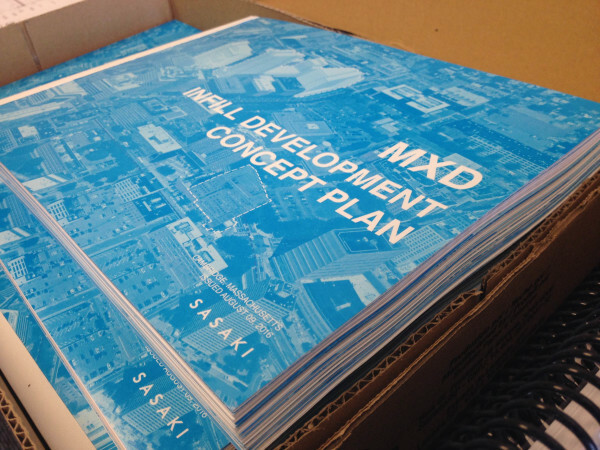 Boston Properties will have presentations from Sasaki and VHB who are conducting the master site planning and technical analysis for the site. Boston Properties has begun planning the Infill Development Concept Plan for the KSURP. BP and Sasaki Associates presented a initial set of open space ideas to the CRA Board in March 2016. The open space improvements along with streetscape enhancements will provide the urban design framework for future infill commercial and residential development. The open space ideas in the presentation contemplates: a new separated bike facility along the Officer Lowery Walkway; interstitial open spaces with play areas, bike parking, and seating; and public gardens on rooftops and enclosed atrium. See the presentation below and provide any reactions and ideas in the Community Forum link above. As the Open Space Plan develops further, the CRA will host additional meetings and opportunities for community discussion. The design team will return to the CRA Board on May 18th to discuss the status of the planning and introduce the sustainability strategies for the project. On Monday December 21, 2015, the Cambridge City Council passed significant changes to the Kendall Square Urban Renewal Plan and the MXD zoning district in the heart of Kendall Square that will allow an additional one million square feet of commercial and residential development. The MXD District now includes one of the highest percentage of affordable housing requirements in Cambridge as well as provisions requiring active ground floor frontage, open space, innovation office and retail entrepreneurship opportunities. This was a direct outcome of the K2C2 planning process undertaken by the Community Development Department (CDD) from 2011-2013 to imagine a new long-term future for Kendall Square focused on diversity of land uses, improved public realm and environmental sustainability. Residential: 25% of the residential development will be below market including 20% reserved for low/moderate income and 5% reserved for middle income. Additionally, 5% of the new residential development will contain 3-bedroom units which will be dedicated to the City’s below market housing programs. In total, the development is anticipated to include an estimated 560 housing units with an estimated 140 of those being below market. Boston Properties has committed to a portion of the residential development to be ownership rather than rental only. Retail: 75% of the ground floor must have an active frontage with a minimum of 25% of that frontage reserved for local and independent retailers. The CRA and Boston Properties have also made a commitment to work together to create a new program targeted at start-up retail uses in an entrepreneurial or developmental stage of business. The zoning includes incentives to encourage grocery stores or pharmacies, something often identified as missing in Kendall Square. Open Space: Establishes a new metric of 15% of the land area in the district to be maintained as open space, and requires a strategy for open space activation and programing. Parking: Lowers the minimum required parking for residential development in the district to 0.4 spaces per dwelling unit to further enable and encourage car-free living as well as lower the cost of development which is passed onto renters. The zoning also removes the minimum parking requirement for commercial development and establishes maximums for all land uses. Sustainability: The new development must be designed and built to the LEED Gold building standard, be built solar ready, and assess the feasibility of connecting to district energy systems. Public Transit: Establishes through the CRA a new transit investment fund with an initial $6 million commitment to support improvements to public transit serving Kendall Square. The next stage of the development process is the creation of an Infill Development Concept Plan which needs approval of both the CRA Board and the Planning Board. Public meetings are anticipated to review this document in 2016. The new zoning spells out an extensive set of requirements for what is to be included in this document including a site plan, phasing plan, a transportation impact study, open space plan, new urban design guidelines, sustainability plan and a retail plan for the district. We thank you for your participation and interest in this year-long zoning discussion, we will continue to utilize your input from the past year and engage with you in further public dialog as more detailed work begins. Please continue to follow the project on CoUrbanize in order to continue to receive updates as we move forward into design, permitting and implementation. On Wednesday December 16, 2015 the CRA Board unanimously voted to pass further revisions to the CRA's MXD Zoning Petition and KSURP Amendment 10. All revisions and changes presented, discussed and approved at the meeting are captured in the 12-17-2015 memo at this link. The following final documents, which capture all revisions made during the past several months as well as those approved at the latest CRA Board meeting were transmitted to the City Clerk on Thursday 12-17-2015 for consideration by the City Council at the regularly scheduled City Council Meeting on Monday 12-21-2015 at City Hall starting at 5:30pm. Through a series of hearings and meetings, the City Council has requested that the Cambridge Redevelopment Authority (CRA) further revise the MXD Zoning Petition and the Kendall Square Urban Renewal Plan (KSURP). The goals of the requested revisions are to improve entrepreneurship opportunities in Kendall Square, optimize retail space to serve daily needs of workers and residents, and increase the affordable housing requirements, including a focus on family housing. As these goals align with the mission of the CRA, staff has drafted the following revisions to the KSURP Amendment and the MXD Petition for consideration by the CRA Board. These are further revisions to the documents as filed and amended by the City Council on December 7, 2015. The latest changes as described in this November 11th Memo to the Board include 25% below market innovation space; an increase in the affordable housing requirements to 20% low/moderate income and 5% middle income; language allocating the required 3-bedroom units (5% of residential GFA) to be dedicated to the low/moderate and middle income programs; and a commitment to begin a new innovation retail program to encourage and support retail entrepreneurship in Kendall Square. The CRA Board has a regularly scheduled meeting tomorrow, December 16th at 5:30pm at the Cambridge Police Department at 125 Sixth Street. The agenda and meeting documents can be viewed here. The latest revisions to the MXD Zoning Petition and KSURP Amendment 10 will be a topic of discussion including a motion to approve further revisions as described above and in this November 11th Memo to the Board. The MXD Petition and KSURP Amendment 10 will be heard at the City Council meeting on Monday December 21st at 5:30pm. As the City Council voted to pass the previously revised documents to a second reading, Councilors will have the opportunity to ordain the MXD Zoning Petition and approve KSURP Amendment 10 at this meeting. reflect the proposed changes to the KSURP. The hearing is scheduled for Thursday, November 19, 2015 at 5:30 PM in the Sullivan Chamber of Cambridge City Hall. Additionally the CRA Board's November monthly meeting will be held the evening before on November 18th at 5:30 at the Robert Healy Public Safety Building on 6th Street. Today, the CRA submitted a revised version of the tenth amendment to the Kendall Square Urban Renewal Plan (KSURP) and the accompanying zoning petition for the MXD Zoning District to the City Clerk. The CRA has revised the initial proposed text to further refine certain concepts and address concerns raised at the Ordinance Committee hearing of September 23, 2015 and the Planning Board hearing of October 13, 2015. The full package of documents are available in PDF format on the CoUrbanize site as well as the CRA website. The revised documents will be presented as part of a continued hearing about the MXD Zoning Petition and KSURP Amendment during the Planning Board Hearing on Tuesday, November 10, 2015. The CRA is the second item on the agenda and is anticipated to begin at 7:45pm at the second floor meeting room at 344 Broadway, Cambridge, MA. CRA Board Meeting Reminder: Tomorrow, October 21, 2015 will be the CRA’s October Monthly Board Meeting held in the first floor Community Room at the Cambridge Police Department Headquarters at 125 Sixth Street, Cambridge, MA 02141. An SEIR update will be presented at this meeting. CRA Board Meetings are open to the public, we look forward to seeing you there. The tenth amendment of the Kendall Square Urban Renewal Plan (KSURP) and the accompanying zoning petition for the MXD Zoning District will be the topic of discussion at the Ordinance Committee of the City Council on Wednesday September 23 at 5:30pm in the Sullivan Chamber of City Hall. The hearing will also be televised. The KSURP Amendment and MXD Zoning Petition are the subject of a Planning Board hearing on Tuesday October 13, 2015 at 7:00pm at the City Hall Annex, 344 Broadway. The CRA is seeking a recommendation from the Planning Board and approval from City Council on both documents. The full package of documents which are available in PDF format on the CoUrbanize site as well as the CRA website includes 1) an introductory letter from CRA Board Chair Kathy Born summarizing key updates and changes, 2) two copies of the MXD Zoning District Petition - one formatted to outline only changes to the zoning, and one formatted as redline edits within the full text for greater legibility and 3) the KSURP Amendment 10 in a redline format for greater legibility. The CRA submitted the tenth amendment of the Kendall Square Urban Renewal Plan (KSURP) and an accompanying zoning petition for the MXD Zoning District to the City Clerk for the August 10th summer meeting of the City Council. The full package of documents which are available in PDF format on the CoUrbanize site as well as the CRA website includes 1) an introductory letter from CRA Board Chair Kathy Born, 2) two copies of the MXD Zoning District Petition - one formatted to outline only changes to the zoning, and one formatted as redline edits within the full text for greater legibility and 3) the KSURP Amendment 10 in a redline format for greater legibility. The CRA Board adopted the following KSURP Amendment #10 on July 15, 2015. A Notice of Project Change (NPC) has been submitted to the Massachusetts Environmental Policy Act (MEPA) office for this project. The proposed project change consists of an amendment to the Kendall Square Urban Renewal Plan (KSURP) to allow an additional approximately 1,034,000 square feet (sf) of commercial and residential development within the Kendall Square neighborhood of the City of Cambridge. The project was last reviewed by the MEPA Office in 2010. The project change consists of new commercial office/innovation space development over the Cambridge Center North Garage, a new residential building at Eleven Cambridge Center, and a new mixed-use building at Three Cambridge Center. The project change also includes an expansion of the existing Whitehead Institute building at Nine Cambridge Center and the conversion of mechanical space into commercial office space at the Broad Institute at 75 Ames Street. According to the NPC, the project change will result in 10,512 unadjusted daily vehicle trips or 3,638 adjusted daily vehicle trips (accounting for average vehicle occupancy and mode split). The project requires Urban Renewal Plan Amendment Approval from the Massachusetts Department of Housing & Community Development and compliance with the Massachusetts Contingency Plan through review by the Massachusetts Department of Environmental Protection (MassDEP). The project may also require an Air Quality Permit from MassDEP. The Urban Renewal Plan Amendment also requires approval by the Cambridge Redevelopment Authority and Cambridge City Council. Components of the project will also require review and Special Permit Project Review Approval by the Cambridge Planning Board. The Proponent has requested that a Single Environmental Impact Report (EIR) be prepared in lieu of a Draft and Final EIR. A scoping session will be held to discuss the NPC, associated changes, changes in environmental impacts and mitigation, and to receive advice and comments from agencies, officials, and citizens regarding which environmental issues, if any, are significant for this project. Opinions as to the extent and significance of possible environmental impact will be welcome. Comments on the project will be welcome in writing prior to May 22, 2015. A Certificate on the NPC will be issued on May 29, 2015. If you plan on attending, please bring your hard copy of the NPC filing to the Scoping Session in order to save paper. A copy of the NPC may be requested from the project contact listed above. Pursuant to the requirements of the Americans With Disabilities Act, this Meeting Notice is available in alternative formats upon request. Questions on the meeting may be answered by contacting Page Czepiga, MEPA Analyst at (617) 626-1021. On April 15, 2015, pursuant to the Massachusetts Environmental Policy Act (MEPA) and its implementing regulations, the Cambridge Redevelopment Authority (CRA, or the “Proponent”) in conjunction with Boston Properties (the “Redeveloper”) has submitted an “expanded” Notice of Project Change (NPC) for an amendment to the Kendall Square Urban Renewal Plan (KSURP). The Plan Amendment would allow an additional approximately 1,034,000 square feet of commercial and residential development within the Kendall Square neighborhood (the “Project Change” or “Project”). In accordance with Section 11.10(7) of the MEPA regulations, the Proponent has distributed the NPC to state and local agencies as well as other interested parties, as listed in Appendix A of the NPC. The Proponent has also posted an electronic version of the NPC on its website at: www.cambridgeredevelopment.org or here at this link. Hardcopies of this document are available upon request by contacting Lauren DeVoe at (617) 728-7777 or email at ldevoe@vhb.com. The CRA has compiled and summarized the findings from the collaborative exercise at the March 12th Public Forum. We began posting a random selection of voices from the Public Forum here on the CoUrbanize website under the Community Forum Tab. These appear as coming from "Meeting Participant." We have now posted a summary report of the Public Forum here. Additionally, at the March 18th CRA Board Meeting, slightly revised text of the Kendall Square Urban Renewal Plan was discussed. That version can be viewed on the CRA website here. The 2014 Annual Kendall Square Traffic Report was also presented to the Board at the March 18th meeting. A copy can be found on the CRA website here. The next CRA Board Meeting is coming up next Wednesday, April 15th, and all are welcome to attend. The KSURP discussion at this meeting, agenda item #10, will include the Public Forum Summary as well as the upcoming Notice of Project Change document to be filed with the state's Massachusetts Environmental Policy Act (MEPA) Office regarding the Urban Renewal Plan Amendment #10. The Cambridge Redevelopment Authority (CRA) March Board Meeting on Wednesday March 18th will include three agenda items related to the KSURP A) Discussion of additional text revisions to the Kendall Square Urban Renewal Plan Amendment B) The Annual 2014 Kendall Square Traffic Study C) The Kendall Square Housing Analysis Study commissioned by the CRA. If you were able to attend the Cambridge Redevelopment Authority KSURP Public Forum last week, we hope you found it informative and engaging. If not, the meeting materials are posted here and on the CRA website. A summary will be posted soon. The public forum discussed a proposed amendment to the Kendall Square Urban Renewal Plan (KSURP) including a presentation and discussion of the potential next phase of commercial and housing development within the MXD portion of the Plan Area. Those who could not attend this meeting are encouraged to contribute to the ongoing discussion on the KSURP coUrbanize site on the Community Forum page. The Board will be reviewing and taking comment on a draft urban renewal plan amendment for the Kendall Square Project Area. This first draft amendment has also be posted on the coUrbanize site. Thank you for visiting the project information site on the Kendall Square Urban Renewal Plan (KSURP) Amendment. On this page, you can view project plans, documents and status updates. We look forward to working with you as we update the Kendall Square Urban Renewal Plan.